While at Madison’s, the bartender – a serious ‘cue enthusiast – said we were essentially out of luck for truly high quality ‘cue in the area. 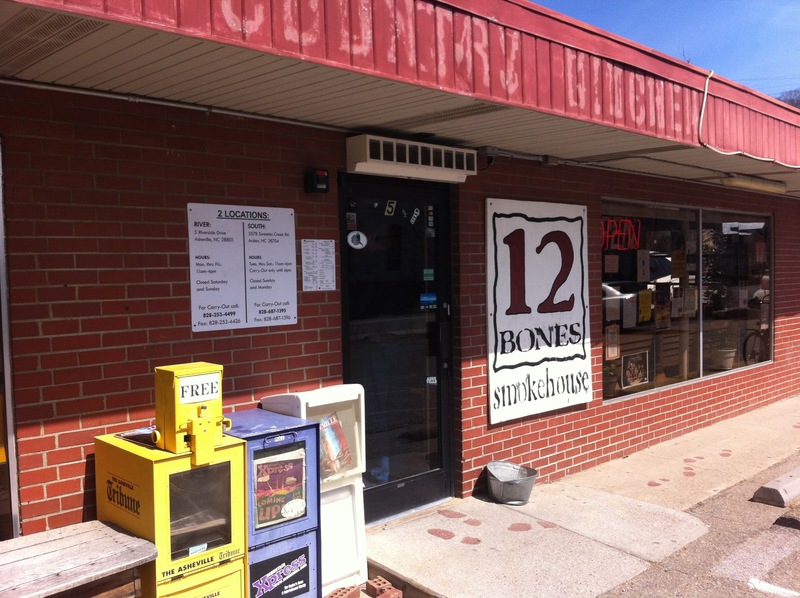 But when we told him we were going to Asheville, he brightened, saying “There’s good ‘cue there” and pointed us at 12 Bones. The reception folks at our hotel in Asheville were enthusiastic as well, telling us that’s where the president eats when he comes through town. So my hopes were raised. As you can see they clearly have a sense of humor about the place. They are only open from 11a-4p and we were told to expect a line, albeit a fast moving one. We lucked out, there was barely a line at all and before you know it we were on to ordering. The place is small – maybe room for 30(?) 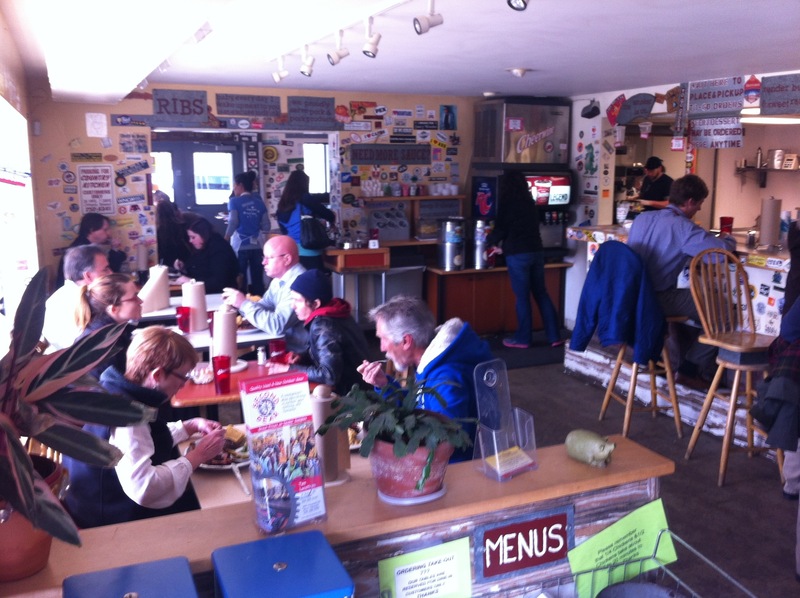 indoors – though there’s outdoor picnic tables available. 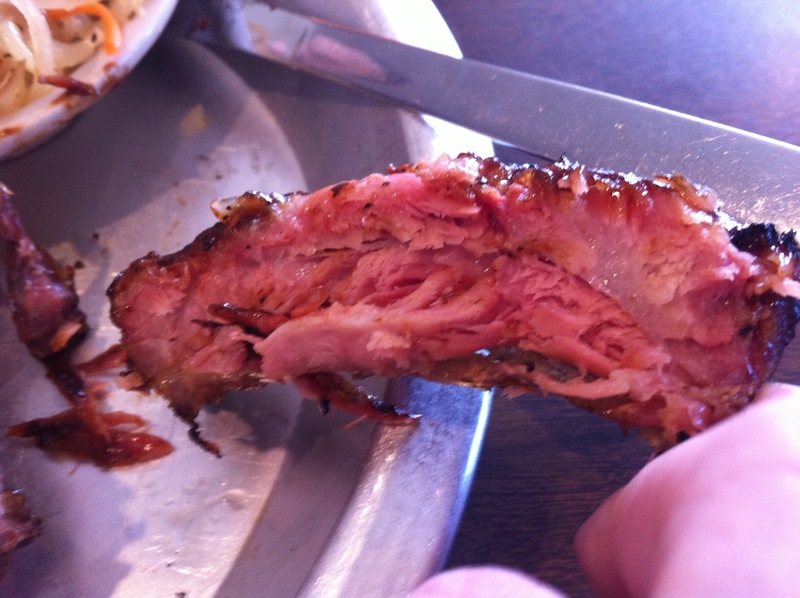 At the counter, I ordered a half rack of ribs. They have four different preparations(!) including a traditional and something that was their “most popular.” Trusting in the wisdom of crowds, I ordered the most popular. The ribs came in a chipotle and blueberry glaze. I also got the Mac and cheese and sweet vinegar cole slaw as sides. They offer a selection of local beers so I ordered one. We snagged a table and quickly the food arrived. 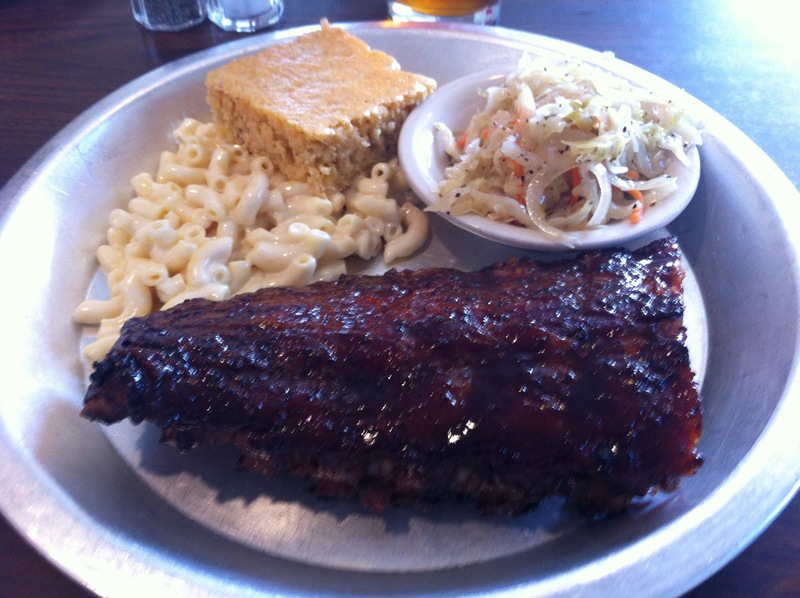 The ribs came in a thick slab that required a fork and knife to cut. Unlike Fat Matt’s in Atlanta there was some fight to this meat – it was in no danger of going anywhere. In fact at first I thought they were a little tough, and furthermore not all that hot, temperature-wise. Had they been reheated or something? Happily the glaze was not thick at all. Just enough to add a little flavor – not drown it. The flavor in my opinion was unconventional and not at all what I had been expecting from such a highly praised ‘cue joint. It taste like flavored ‘cue! This wasn’t traditional! What the heck! And it’s tough! And not hot! In all honesty, my first reaction was disappointment. However, the place won me over as I kept eating. First of all, the technique was there – a good bark, underlying smokiness, great (if unexpected and unconventional) flavor. What was the matter? What was wrong? Thinking about it, my blunder was obvious: I ordered theme and variation on Carolina ‘cue and had somehow expected classic Carolina ‘cue! This was delicious! Just not what I expected. Yes it could’ve been a bit hotter, and I was surprised by the toughness, but the bark, the flavor, that blueberry working with the smoke, the chipotle undercurrent was all blending together winningly. It was really good. Of course theme and variation on ‘cue is their most popular item – it’s served in a state filled with ‘cue aficionados who routinely eat straightforward ‘cue! I was the one who blew it by expecting straight ‘cue – which they serve but I didn’t order. The sides are also worth cheering. 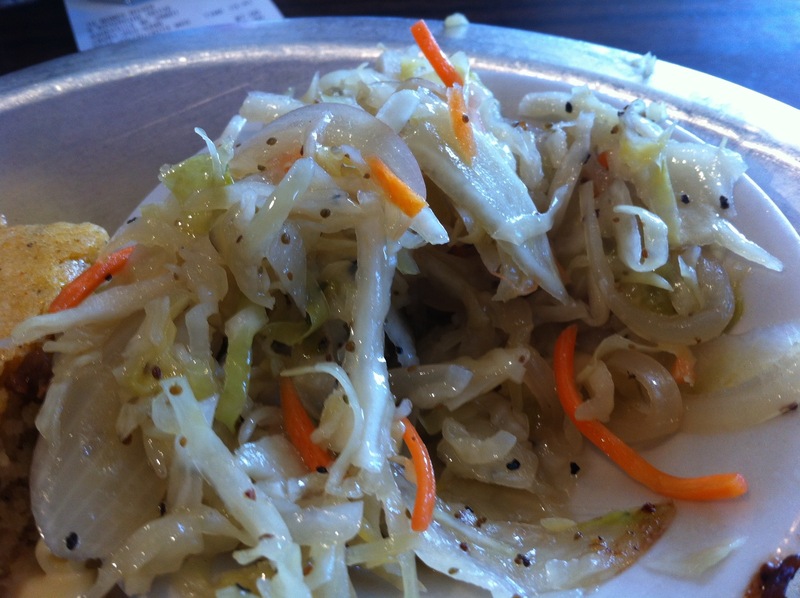 The sweet vinegar cole slaw was fresh, crisp, sweet (as promised) and delicious. The Mac was of the creamy variety, with perhaps an undercurrent of either cream cheese or sour cream. I was also able to sample the corn pudding (delicious!) and the pork-sprinkled collard greens. They were all wonderful. Finally let me add the line of people sure enough did keep coming… . I feel their chipotle blueberry glaze has expanded my palette and perhaps the possibilities of ‘cue.